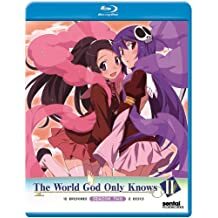 HomeReviewThe World God Only Knows Review – The Galge Conqueror! No ratings yet. 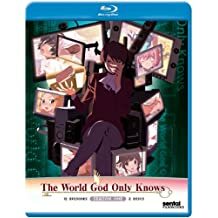 The World God Only Knows Review – The Galge Conqueror! Galge or dating simulation game has become more a trend among the otaku. You will also find interesting branching route in every girls you choose to date, whether it’s bad, good, or best ending. You can also reset your life to date another girls and re-starting your story with her. But, is dating and falling in love with 2D girls really fun and can make your heart beats so fast? Well, at least there is one boy who always conquering any girl’s heart, both in games and real life. Katsuragi Keima, the name who can make any girls falling in love with him. It’s not because he’s super handsome like Usui Takumi, super genius like Yagami Light, or super cool like Kirito, but because he has an ability to know a girl’s feeling based on his experience in galge. Note: If you still single until today, you need to learn how to understand girls through some galge games. Sometimes, it will work. Yeah… sometimes! This anime is a kind of Harem genre, but you will also find some interesting aspect such as parody, fantasy, and humor, which make this anime not boring at all. If you need some romantic-comedy anime series, maybe you can go with this one! 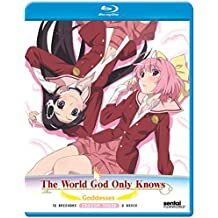 The World God Only Knows, or abbreviated as “KamiNomi” and also known as “Kami nomi zo Shiru Sekai” in Japan is anime TV series produced by Manglobe based on the Japanese RomCom manga series written and illustrated by Tamaki Wakaki. The KamiNomi manga was serialized by Weekly Shounen Sunday with 26 tankoubon volumes were published by Shogakukan. The anime itself has 3 seasons so far along with some Original Video Animations. Sentai Filmworks announced that they have licensed the anime in North America and released the first season on DVD and Blu-ray disc on January 2012. Synopsis: High school student Katsuragi Keima really loves girls, but not in the normal sense. The girls he loves are that of the 2D girl or digital realm, princesses of the several dating sim games he spends every single waking moment playing. Moreover, his lady love has earned him the title of “capturing god” between the online gaming community considering he can properly win over any game heroines. Sadly for Keima, this title has pulled some uncommon attention. One day he receives a weird email challenge and turns into roped in assisting a demon Elsie capture escaped souls. In order to capture the souls, he ought to first capture the girls’ heart they have lodged themselves into. Story: The story is sort of simplistic and sometimes very predictable but it is not going to detract from the enjoyment of the series, of watching Keima have trouble with his new quest all the while getting help from cute Elsie’s clumsiness. All in all a very entertaining watch with several comedic scenes along with some several heart touching moments. Artwork: The art is wonderful. Even though I have seen far better and more creatively drawn anime, with regard to the context of this anime, the art is drawn really properly. For instance, during the comedy moments, the art is drawn chibi with several elements that further resonates the humor, whether it be a small action or object in the background. The artwork never stops your enjoyment of this anime and even increases the experiences with elegantly drawn characters like Elsie. Characters: The main character Keima is the highlight of this anime. His perspectives on 2D world and real life is very interesting and pretty much funny, so watching him who have never even had a real conversation with a real girls, capture the interest of real girls is absolutely impressing. Each arc has one girl and those episodes is usually around 2-3 episodes long. To see this young boy conquer real girls through the use of information from visual novels is very funny, and best of all, it really works! Read also: The 10 most popular Kami nomi zo Shiru Sekai Characters on internet. Sound: The anime has no a particularly memorable opening and ending theme, but it comes with creativeness that far exceeds some memorable-themed anime. In episode 4 you can find an extra opening and ending that in some way personifies the storyline and shows careful planning that went along with it. This skill to creatively adapt to the content of each episode with compatible musical compositions is what truly separates this anime from some others. Overall: The World God Only Knows is a superb anime overall. It mixes comedy and adventure successfully into a masterpiece that a lot of previous anime have tried and failed to accomplish. 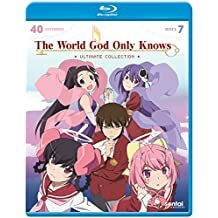 If you are looking for a funy anime that still contains a good story played out by nice characters, The World God Only Knows can be an anime that you need to put on your list.